Have you ever been on a cruise, or are you considering sailing on a cruise ship? Well, if you're a bit of a people watcher, then this audiobook will provide some cruising entertainment. 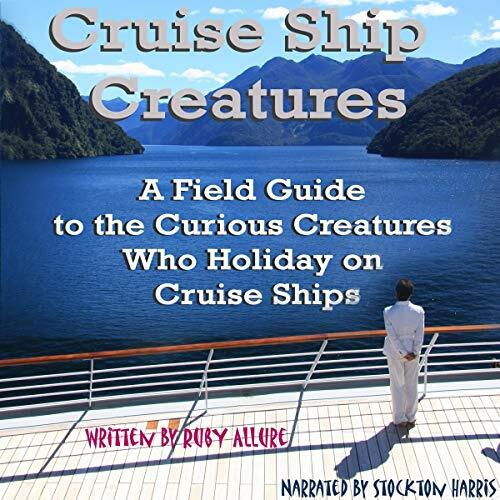 Using this field guide, you can spend hours fascinated by the numerous "Cruise Ship Creatures" and breeds that emerge on any given cruise. With that in mind and with the intention to add a bit of fun to those lovely sea days, here is your perfect opportunity to spot a whole variety of "Cruise Ship Creatures". I received a free copy of this in exchange for an unbiased review. I'm totally against cruise ships and you'll never see me on one. I still found it funny and could totally picture the "creatures" in this book. I am truly sorry that I can not understand a word that the narrator is saying. With all the good reviews I would loved to have understood the narrator, therefore I can not in all honesty give a great review. I received this free from the author or narrator for an honest review. Anyway if you’ve lived at all you can find yourself or someone you know or seen who fits into this humorous look at people. The narrator did an excellent job of giving life and fun to the stories without feeling it was meant in a mean way..just a fun look at human behavior. I recognize some of these cruisers but I still .. I recognize most of these cruisers but I still love cruising. If you've never cruised don't be too scared about all the different people who will be on your cruise with you. The ships are large and there are so many places to hang out that you'll probably never see most of them but you can certainly laugh when you do! It was fun to listen to - really to laugh along with this book. Every different type of person he talks about is truly on board every cruise ship I've ever been on. Part of the fun to cruising is all of the people watching that you can do. This is more silly than informative but really a fun book. I would recommend this to people who have ever cruised because you will be able to relate and to those who never have. Overall this was entertaining and I got a few good laughs. It shows there are a lot of different types of people who take cruises. They all have their particular behaviors. This seemed to focus mostly on older cruisers and how they behave on their cruises (away from home and people they know). My biggest issue with this book is that it was written by a female but narrated by a man. I'm not quite sure why they did it this way but it confused me a couple times! I was voluntarily provided this review copy audiobook at no charge by the author, publisher and/or narrator. A very funny look at the people who cruise. Having been on a couple of cruises it's easy to look back and remember seeing these characters. The Narrator did a very good job keeping you involved. Okay, this is really funny. I laughed out loud and giggled some more. I have never been on a cruise ship, but I feel like I have now. Ruby and Michelle have a good chemistry. Stockton did a nice job with narration. I had it on in my car and my sister was laughing out loud too. I was given this free review copy audiobook at my request and have voluntarily left this review. going on a cruise or having gone on one.It is quirky and fun and creative and most listeners will enjoy this book. * The determined readers that *will* finish their books while sitting on the desk, stormy weather be damned. Loved the part in which the author is almost assured that a reader is superglued to the deck in their drive to finish a few pages. The format lends itself well to listening during a busy day: there are 105 chapters that are only 2-3 minutes long, making it easy to listen while driving to the office or while putting on makeup in the morning. If you get pulled away it’s easy to find your spot or even relisten to a whole chapter. The author has a cute style and would definitely consider this to be light reading (“beach book”), maybe even perfect for a cruise. I enjoy going on a cruise and when I read the reviews on this audiobook I could not resist. It is not a book with a storyline but rather a series of short narratives which make this audiobook ideal for short burst. Not only are the stories funny but when you consider they are real then they become hilarious. The author relates her stories on board cruise ships with delightful ease and with wicked humour whilst the narrator is absolutely brilliant with a delivery that makes you feel as though he is sitting next to you on the sofa reliving anecdotes from the sea rather than reading a book. I started listening to it in the kitchen whilst baking but after crying with laughter I completely forgot where I was in the baking process and had to start again. I cannot recommend this audiobook enough. A must for all who cruise and anyone who wants a jolly good laugh. A feel good audiobook!